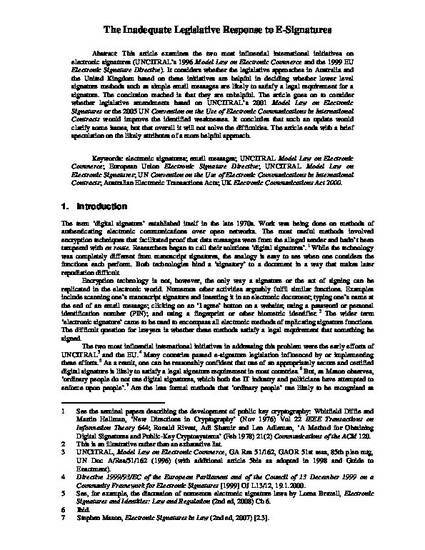 This article examines the two most influential international initiatives on electronic signatures (UNCITRAL’s 1996 Model Law on Electronic Commerce and the 1999 EU Electronic Signature Directive). It considers whether the legislative approaches in Australia and the United Kingdom based on these initiatives are helpful in deciding whether lower level signature methods such as simple email messages are likely to satisfy a legal requirement for a signature. The conclusion reached is that they are unhelpful. The article goes on to consider whether legislative amendments based on UNCITRAL’s 2001 Model Law on Electronic Signatures or the 2005 UN Convention on the Use of Electronic Communications in International Contracts would improve the identified weaknesses. It concludes that such an update would clarify some issues, but that overall it will not solve the difficulties. The article ends with a brief speculation on the likely attributes of a more helpful approach. Forder, J. (2010). The inadequate legislative response to e-signatures. Computer law & security review, 26(4), 418-426. © Copyright 2010 Jay Forder. Published by Elsevier Ltd. All rights reserved.